Today marks the 20th anniversary of World AIDS Day. Wear a red ribbon, tell someone you have AIDS even if you don’t. Make people aware in any way you can. Be creative! To think back to the first World AIDS Day, one year after my diagnosis, is a bit trippy... I did everything I could to avoid the topic, plus I had better things to think about. (I was 13- video games and girls.) I’ve been fortunate the last several World AIDS Days. Every year, Gwenn and I go out for at least a week, doing a series of talks, just explaining how our relationship works and what we do to keep Gwenn safe from HIV. World AIDS Day is needed, and it is vital. Your local paper may have a listing of an event in your community- think about attending. Even if it’s as simple as buying a cup of coffee at Starbucks (they are donating 5 cents for every drink sold today to the Global Fund). That adds up, and before you knock 5 cents (lots of idiots on Facebook were), multiply that many thousands of times over and be thankful that a corporate giant isn’t afraid to associate itself to the cause. After twenty years of World AIDS Days, we still have a long way to go. Through dumb luck/unconditional love I’ve been able to survive. 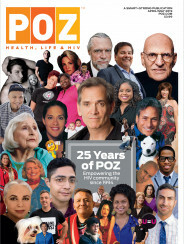 My health is good enough that I most definitely have 20 more World AIDS Days left in me, and I will continue to speak out and honor the memory of those we have lost- and will continue to lose- along the way.